Paranormaly Yours: Buy This Christmas: A Chartreuse Story today and half the proceeds to go an ANIMAL SHELTER in need!! 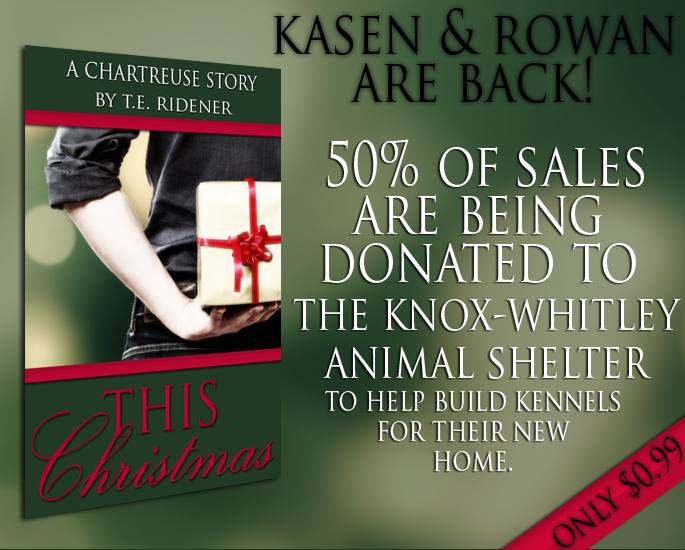 Buy This Christmas: A Chartreuse Story today and half the proceeds to go an ANIMAL SHELTER in need!! In November of 2013, the Knox-Whitley Animal Shelter in Corbin, KY suffered a devastating fire that not only destroyed their building, but claimed the lives of several beloved dogs and cats. Now they have a new building, but they are in need of new kennels. One of the main characters in Chartreuse, Rowan Kelly, is a veterinarian and I firmly believe if he were a real person, this is something he would want to help with. I donated $300 from Chartreuse's sales to The Ronald McDonald House and The Trevor Project a few months back, and now I would love to donate again with my new story THIS CHRISTMAS: A Chartreuse story to another deserving cause. 50% of sales will go towards getting the kennels KWAS needs. I thank you in advance for your support. Note from Paranormaly Yours: My love for animals runs deep, and has my whole life. Having worked in the Veterinary field for many years, I know from my experiences how hard it can be to rebuild from any type of situation, and get even just the basics that are needed for a Veterinary office, let alone a shelter. So please, show your love for our furry friends, cause they deserve all the comforts we can provide for them while waiting for their forever home. Any, and all donations for the Knox-whitley Animal Shelter will be greatly appreciated, and very welcomed. Oh that's a great idea! City Lights by Julie Morgan is LIVE!! The Love List Blog Tour & GIVEAWAY! !